The link to the lounge also affords access to the in-house shop, Wendy’s, and to the garden atrium. 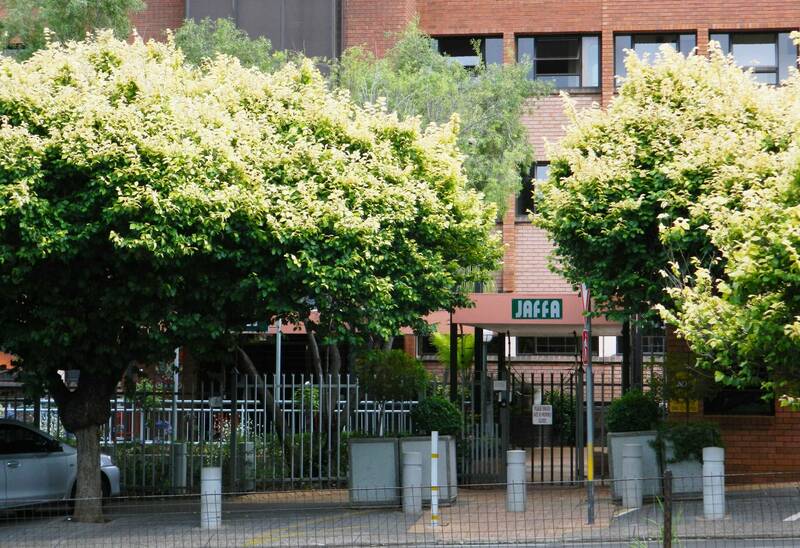 Situated in a beautiful leafy green suburb of Pretoria, our very special city, JAFFA offers single and double accommodation of various sizes and configurations. It allows our residents, home from home comfort. Run by a dedicated, caring staff, it offers three wholesome kosher meals a day with mid-morning and afternoon refreshments. Daily activities, outings, meetings, visitors, lectures, shiurim, entertainment organised by qualified staff and eager volunteers, gives you the option of being creative, artistic, challenged, stimulated, useful, or just to relax, if that’s your choice. Medical care is provided, as well as general security. There are staff on duty every day and night of the year to protect residents’ welfare. There are suitably qualified Professional Registered nurses, to care for all medical needs and emergencies. Care is paramount. Interesting visitors from overseas and locally, attend Jaffa regularly to share their experiences and knowledge. 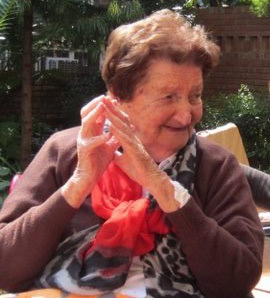 It is the heartbeat, (or social pulse), of Pretoria Jewry. Jaffa hosted their first wedding for a member of the Pretoria community, Ruth Rom. Mazel tov to the Kallah and Khatan! Norah Ginsberg celebrated her 100th birthday with a huge honor from Jaffa that was well deserved. 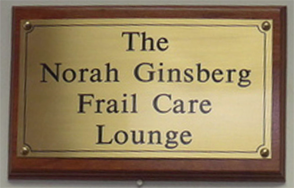 Jaffa dedicated the Frail Care lounge to Norah for everything she has contributed to the Pretoria community over the years, they hope in doing so that Norah will always be remembered by all the Pretorians. Happy Birthday Norah! 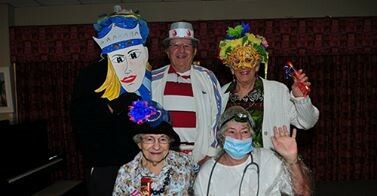 Jaffa residents had a wonderful time at their Purim party this year. To quote a resident, "We are so privileged to have a facility of this caliber in our city". Smiles are like medicine, keeping people strong! Go Jaffa! To view more pictures, click here. 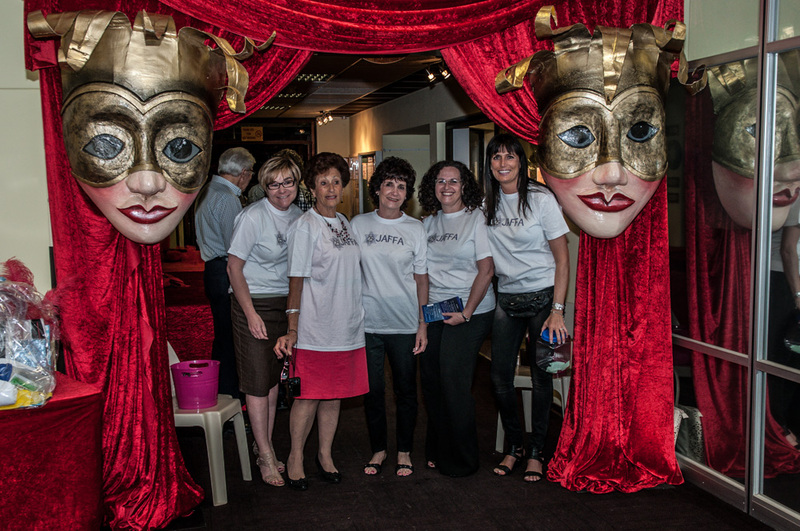 Thank you to Julian Pokroy Photographic for the images. PARTY IN PRETORIA! Jaffa recently celebrated their 25th Birthday. The gala was held at Jaffa, home to a hundred residents in Pretoria. Highlights of the evening were performances by Cyril Green and Nik Rabinowitz. Jaffa's directors from the last quarter century were honored. Len Klein and Ronnie Silberman, the first and second directors and Mark Isaacs the current director. Another successful event was enjoyed! Face to face with Mark Isaacs, Jaffa’s new Executive Director Contributed by Jaffa House As the new Executive Director of Jaffa, what have your first impressions of our home in Pretoria been? Mark Isaacs - After hearing stories of how “old age homes” look and operate, I was amazed at how different Jaffa is. The home is bright and cheerful and runs like clockwork, the staff are motivated, willing and exceptionally professional in all their dealings with the residents. What is your message to our community regarding how they can step in and see that Jaffa is a reality for the next generation? Mark Isaacs - The Pretoria Jewish community stick together more than any other community I have known. Here in Pretoria, you cannot be anonymous. Jaffa was a vision turned into a reality that must continue for years to come, the community are very generous in their support for this magnificent home, what would be of great help is if the younger members of the community became more involved through volunteering. Areas that we need assistance in are: the shop, function planning and generally just being around to give a hand. It would also be wonderful if the people could visit the elderly. As this is a community home you are welcome here on Sunday afternoons when we have concerts and when we have film shows in the evening. 80 is the new 60: is Jaffa changing any of its, let’s call them rules, to deal with those who don’t feel that old just yet? Our Occupational Therapist Daleen Botha and Social Worker Jill Shaskolsky work very hard to ensure that every one is catered for, there are groups and discussions for all ages. Finance is always a hard topic; do you have any ideas to fill the gap between the income and expenses? Mark Isaacs - There is always a need for financial assistance, we have a shop Wendy’s which is run by the residents committee; it sells delicious kosher biscuits, sweets, cold drinks etc. There is a good selection of Judaica and gifts in the shop. Jaffa’s kitchen also provides kosher takeaway meals at very reasonable prices, we supply hospitals and conference centres. Now we are looking to increase the range of products that we supply from the kitchen. We have gift cards available for special occasions and donations are always welcome. The money raised from events like morning markets and golf days goes some way to help the finances. Fundraising is vital and without the help of the community we would not be able to survive. It is Jaffa’s 25th birthday this year, we have some very exciting events planned. Now that we have got that out of the way, it would not be a Jewish interview if we did not ask you to comment on the food at Jaffa? Mark Isaacs - Traditionally if you are Jewish there can be no meeting without eating! We employ a full time Mashgiach and are under the supervision of the Beth Din. The residents enjoy three kosher, nutritious balanced meals a day. The dining room is always a buzz. Mid-morning and afternoon tea served in the lounge is enjoyed with cake or biscuits. All in all, the food is well prepared and presented. There are very few complaints. I often eat at Jaffa to ensure what we serve our residents is of a high standard. We encourage members of our community to join us for Shabbos Dinner or other any meal. We will always provide special meals or over Yom Tov and offer Pesach Seders to the community. Farewell to a Man of Many Talents - Ronny Silberman Contributed by Jaffa House Super-fast, efficient, multi-tasker, high energy, a real mensch are the adjectives you will hear when you ask residents and staff at Jaffa to describe Ronny. Some will say he is like a father to them when they reflect on the way Ronny made their transition to Jaffa so smooth and comfortable. It is not easy to keep up with Ronny, the staff at Jaffa know him well from the back as most are running behind him trying to get a word in. Under Ronny’s watch Jaffa can boast a five star home for the aged, serving kosher meals, offering expert and caring nursing, occupational therapy, counseling, a full laundry service and the list goes on. Senior and junior staff at Jaffa have high regard for Ronny quoting him as being "firm but fair, he will make time for us and assist wherever possible. Mr. Silberman makes it his business to get to know people, he appreciates hard work and going the extra mile". Ronny sees the potential in people, encourages ongoing studies and hard work. Recently one of Jaffa’s security guards was promoted to reception, and he is doing a sterling job. This is typical of Ronny’s driving nature. The role of Executive Director for a Jewish home in Pretoria will come with its fair share of criticism from the community. Ronny has always strived to take constructively what is suggested and implement ways to do better. Pleasing residents, resident’s children, staff and unions makes this man happy. Ronny Silberman retires from Jaffa after fourteen and a half years. The president, executive, committee, staff and residents wish him and Gertie a happy and healthy retirement. “Ronny, we thank you for looking after our parents”.